Remember the book The Very Hungry Caterpillar? In one week, the caterpillar eats through a single red apple, two pears, three plums, four strawberries, and five oranges, chocolate cake, ice-cream, a pickle, Swiss cheese, salami, a lollipop, cherry pie, a sausage, a cupcake, and a slice of watermelon. Eventually, it realizes that it’s overdone itself and decides to stick to salad before turning into a butterfly. In real life, caterpillars just eat leaves. They are generally harmless creatures that sometimes turn into beautiful butterflies. 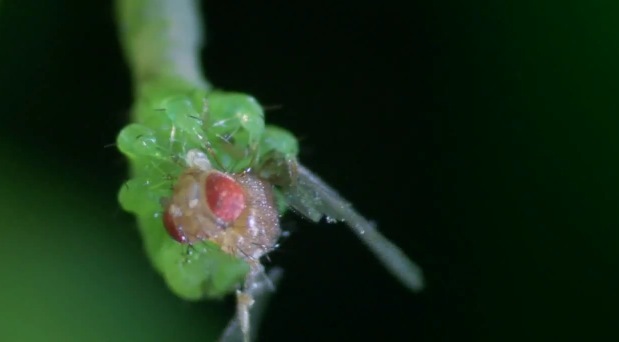 Well, the BBC shot some incredible footage of a meat-eating caterpillar in Hawaii, which was featured in its show the South Pacific, Episode 1. Ocean of the Islands. This footage is unlike anything I’ve ever seen before and it somehow terrifies me in the same way that Vampire bats, poisonous snakes and Great White Sharks tend to do.